My darling Aunt-in-law, Kimberly, makes some of the most amazing dishes! She so kindly shared her recipe and it is now a family favorite. I adapted her recipe slightly to my families liking, but the base is still the same and the end result is mouth watering delicious! Now that the colder weather is here, there is nothing I love more than to sit down to a bowl of nice, warm, creamy soup! Baked Potato Soup definitely makes it into my top 3 favorite kinds! Need a yummy soup to get you through the cold season, this is just the one for you! This soup is so easy and definitely a family favorite! So creamy and delicious! In a large saucepan, over medium heat, melt butter. Once butter is melted add flour. Stir to make a roux and let it simmer while stirring for a minute. Slowly add milk and half and half. Stir constantly until thickened. This can take a while but be patient, it will. Stir in small diced and tender potatoes along with the sour cream until evenly mixed through. Put in a crock pot and keep on warm until ready to serve. I like to serve mine with bread bowls. Also, in separate bowls, I put cheese, cooked and crumbled bacon, and green onions so that people can add how much they want of what. Oh, that sounds utterly delish, I am going to have to make this on a chilly day so I have bookmarked this page, hope that's ok? We're making this right now!! Thanks sister! I'll let ya know if I ruin it! :) Love you and thanks for all the yummy recipes. This looks so hearty and comforting! 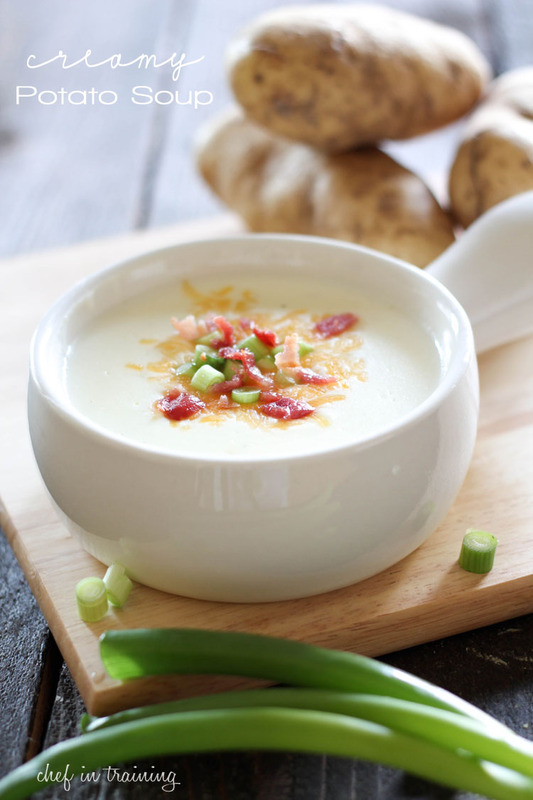 And I'm such a sucker for baked potato soup so I will most definitely be making this soon! Hi there! I'm in the process of making this soup, and I"m really excited about it. However, I have to admit that I"ve never made soup before. As a result, I'm confused about a few things in this recipe. First of all, what does "awhile" mean in step 3? 10 minutes? 20? And how hot should the stove be set for the roux and the thickening of the milk and half and half? I'm sure I would know if I had more experience, but I do not. What should the various stage mixtures look like? Some insights as we go would be helpful. Thanks! I made this soup it was easy and delicious. Kelsi--keep your temp at medium like 5-6 on the dial. And it was about 10 minutes in step 3 of stirring. It is worth the effort. I love creamy soup, I must try these with potato. Thank you, Nikki! I made this for dinner tonight and my family LOVED it! Perfect for this chilly November evening. I made this tonight. My husband and I loved it. I left out the sour cream because I am not a fan and I mashed the potatoes just a bit after I added them to the cream. So good. I am trying this tonight and can't wait to see how it turns out. Thanks for the recipe! Just made this for Christmas Eve dinner. Had to have a bowl as I was putting it in the crock pot. Oh, it is so yummy! This is a great recipe, but I agree that some very important information is missing. What temperature to put the burner on is crucial when making a roux. Plus, how long and what it should look like when ready are also nice, helpful things. Thanks for the recipe. I've been looking for a creamy potato soup recipe for years. I hope my family loves it. can this be forzen and saved? Made this tonight, LOVE it! Made a half recipe with the 3 potatoes I had leftover from baked potato night. I used 2% milk and subbed whole milk for the half and half. It was too thick with the potatoes, so I added another cup of water. It could easily have taken another cup of water. Topped with turkey bacon and cheddar cheese. Was much better hot than room temperature. Even the kids, who disliked the baked potatoes, ate the soup. I've been looking for a recipe for a baked potato soup that didn't call for so many ingredients. This one looked easy & fast! I subbed about 1/2 cup of finely diced onion for the onion powder called for in the recipe & sautéed with the butter. Instead of the milk, I subbed 4 cups of half-and-half & 2 cups of reduced sodium chicken broth. It was a hit with my family! Thanks for sharing! It was delicious. I only made one change and that was using 2 cups of milk and 2 cups of chicken broth instead of the 4 cups of milk. Can I make this in the crockpot from the start? Or do I have to start on the stovetop first? Thanks!